Tower 23 Educational Fun LandT: Math, Language Arts, and Interactive Puzzles and Games from the mind of Michael Cain. How to play the Pete Noir stocking hunting game. Cut out the poem and the arrows. Use the different colored poems and arrows if there is more than one child going to play the game. If there is more than one player, searching one at a time will cut down on the confusion. Fill your children’s stockings with as many presents and goodies as it can hold. Take it from where it has been hung. Replace it with the note from Pete Noir. Hide the stocking somewhere in the house. Mark a path to the stocking’s hiding spot with the arrows. (Note) Arrows do not have to be placed on the ground. Arrows can be partially hidden and placed in areas that make the player look all round the rooms. 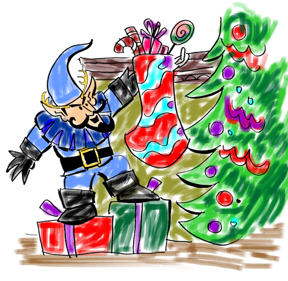 The more creative the path the more fun the player will have finding the stocking. Make sure you have batteries or film for the camera.